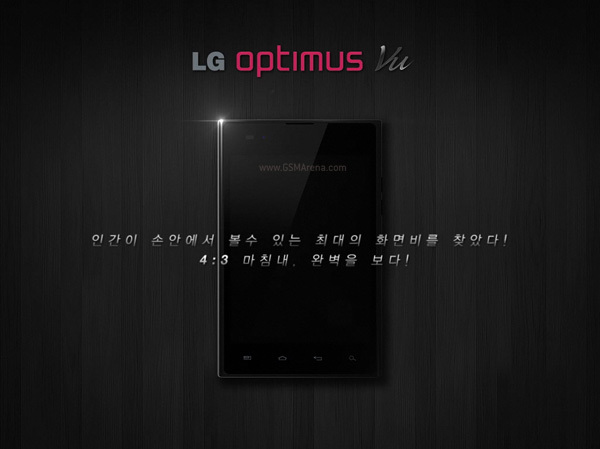 LG has released a teaser for the upcoming Optimus Vu in Korea. The highlight of this phone is its 5-inch IPS display. But unlike almost every other touchscren smartphone out there, the display on the Optimus Vu has a 4:3 aspect ratio. Due to this, the display on the Optimus Vu will actually have a higher surface area than other 5-inch displays. The rest of the specs aren't official yet but we have heard it will have a 1024 x 768 resolution display, a 1.5GHz, dual-core Qualcomm Snapdragon processor, 1GB of RAM, 8 megapixel camera, 8GB internal memory, NFC and (sadly) Android 2.3 Gingerbread. It's unclear at this point whether the device will be limited to the Korean market or if we will see it elsewhere as well.